The Best Paragliding blogs from thousands of top Paragliding blogs in our index using search and social metrics. Data will be refreshed once a week. Also check out Paragliding Youtube Channels. Paragliding newsletter is a comprehensive summary of the day's most important blog posts and news articles from the best Paragliding websites on the web, and delivered to your email inbox each morning. To subscribe, simply provide us with your email address. East Sussex, England About Blog A blog about Paragliding, Paramotoring, Hang Gliding, Speed Flying, Freeflight, Equipments and more. Flybubble is a freeflight equipment retailer and flying training centre based in the UK, specialising in personal attention and outstanding service. They stock a wide range and offer expert buying advice, fittings, demo flights, part exchanges and used gear. Facebook fans 10,300. Twitter followers 350. San Francisco, CA About Blog Where pilots of all free flight persuasions mingle: paragliding, hang gliding, speedriding/speedflying, and others! Facebook fans 1,144,818. Twitter followers 505,642. Grassau / Germany About Blog For more than a decade, the heads of skywalk have dealt with the system of flexible flying. The methods have changed dramatically since then, but the passion of the makers has remained the same. Whether a linens specialist or test pilots, every skywalk associate is an absolute specialist in his field. Facebook fans 13,531. Twitter followers n/a. About Blog justACRO.com, the acro paragliding portal serves as the main website of acrobatic paraglider pilots. Large collection of videos, forum, second hand market, acro trick descriptions, glider and harness database, startplace catalog and more. Facebook fans 8,274. Twitter followers n/a. Ketchum, ID About Blog The Cloudbase Collective is a diverse group of professionals who create unique and effective content based around incorporating raw adventure and the accompanying life style to brand awareness. Facebook fans 2,660. Twitter followers 465. About Blog This blog is dedicated for testing recent paragliders and flying gear. Ziad Bassil is flying since 23 years, he is always in a rush to try new gliders as the feeling i get in exchanging wings is for me a unique experience. About Blog Ozone paragliders is one of the world's leading paraglider manufacturers & distributors. It started as a group of pilots with an idea. Build wings that just do everything better: handle better, turn tighter, glide faster, & are more comfortable to fly. Balance all those together, and never compromise. The result is something most pilots can only dream of: the most potent fun factor in paragliding. Facebook fans 41,869. Twitter followers 6,514. About Blog Gin Seok Song and his team of test pilots and engineers live for one thing: making the best possible paragliders. Facebook fans 12,242. Twitter followers 4,165. Noida About Blog 365hops is a location and interest based crowd-sharing platform for adventure, experiential and off-beat travel activities and aims to be one stop solution for off-beat travel in the near future. Their mission is to connect like minded people who are interested in travel and adventure activities which are happening around or in the place of their interest. Facebook fans 52,319. Twitter followers 3,135. France About Blog Follow the news magazine ROCK THE OUTDOOR to discover videos, infos, tips and reports on paragliding. Facebook fans 12,812. Twitter followers 474. About Blog The definitive place to discuss paragliding. Facebook fans 3,966. Twitter followers n/a. Gurgaon, India About Blog Captain Varun Suhag, the founder of Flyboy Aviation, took up paragliding joyride at a hill station in India few years back. His new found freedom of flying led him into making flying a constant part of his life. He aims to fulfill our dream of flying free and soaring high. Facebook fans 13,502. Twitter followers 12. About Blog Paragliding blog for beginners and pilots with news and information from the paragliding scene. Bath, UK About Blog I’m Tim Pentreath and I’ve been paragliding since 1990 and have been flying Advance wings since 1998 when Gavin Foster sold me a second-hand Omega 4. Over the years I’ve flown in a number of comps – BPC and British Opens – and in 2014 I flew in both rounds of the British Champs for the first time and won the Sports Class in Ager and came 3rd place in the Championships in Sports Class. Facebook fans 182. Twitter followers 551. About Blog Sharemyjoys is a blog by Nick Neynens about paragliding vol bivouac in the mountains, photos and position updates. Facebook fans 1,006. Twitter followers n/a. About Blog Birdmen Paragliding is a great source for paragliding in Cape Town and the surrounding areas. Birdmen Paragliding is based in the Northern suburbs of Cape Town and is owned and run by Barry Pedersen. About Blog Himtantra is best for paragliding in bir billing Himachal Pradesh. It offers you this wonderful opportunity to fly like a bird, feel the excitement of sky. About Blog Vertical Dimension paragliding club offers tandem introductory paragliding flights, paragliding courses, paragliding sales and service. They are proud to be the world's leading manufacturer of paragliding equipment. The equipment with which we conduct the training is certified and suitable for this activity. Facebook fans 1,893. Twitter followers n/a. About Blog Paranauten.com is a blog for paragliders, paragliders and paragliders. Here, experiences, equipment such as flight areas are reported. About Blog Paul Cooley is a USPPA Certified PPG Instructor and admitted “adventure addict”. He is also known as the Adventure Pimp as he has been pimping all kinds of adventures. Madcity Paragliding offers Powered Paragliding instruction and sales for both Foot and Wheel Launch flying. About Blog TryFly is a paragliding website. Kamshet , India About Blog Nirvana Adventures came into being in 1997 to fulfill your dreams of free flight by offering a safe standardized and encouraging atmosphere to anyone interested in taking up the sport of paragliding as a hobby. With time, energy and dedication Nirvana Adventures became a pioneering paragliding school that in turn led to the transformation of Kamshet into a world paragliding destination. Facebook fans 5,799. Twitter followers 709. Cape Town About Blog Icarus Tandem Paragliding based in Cape Town started sharing the love with family and friends, they started introducing their loved ones to tandem paragliding. Facebook fans 7,337. Twitter followers 1,784. About Blog This blog documents my experiences with powered paragliding since 2005. I started it as a training tool for myself and to share photos with my friends and fellow pilots The bulk of the material is strait forward flight log entries but occasionally I got inspired and expand on the experience. Brasil About Blog SOL Paragliders is the result of more than 30 years of involvement in the sport - since 1979 has a close relationship with everything that is related to free flight. SOL Paragliders has distributors in 72 countries and has its products being used in all countries of the world where paragliding or paragliding is practiced as it is called in English. Facebook fans 44,959. Twitter followers 3,125. About Blog Vess Paragliding is everything about Paragliding and Tandem Flight. About Blog Globe trotting paraglider pilot in search of coaches, courses, and comps. Facebook fans 4,784. Twitter followers 63. Davos About Blog Discover Davos from a different perspective. We fulfill the dream of flying in the context of an unforgettable paragliding tandem flight in the Davos mountain world. Facebook fans 2,729. Twitter followers 47. About Blog I am Alice Horwood. I am a Pilot, Diver, Skier, Adventurer. My three passions are travelling, paragliding and business. Since the age of 15 I have been addicted to flight. At 17 I gained my Private Pilots License, by 21 I began flying gliders and at 24 took to the skies for the first time with a paraglider. I love the sense of freedom flight provides, especially paragliding. About Blog Parafly have been flying the Parafly school since 1986 directly in the Stubai Valley. Discover interesting and interesting facts about paragliding and get caught up in the magic of flying. Follow this blog to find useful information and insider knowledge for a heavenly flying experience with the paraglider. About Blog My name is Gorgi Ristovski I am from Skopje, Macedonia. I discovered paragliding when I was 18 years old and there has not been a day without thinking about it. Since the start I was addicted to the never ending challenge of understanding the sky as well as the quest of becoming a better and safer pilot. About Blog I fly paragliders. This is what I do and what this website is mostly about. I learned how to paraglide at the age of 15. Since then much has changed, but not my love for this most simple way of getting high. The addiction stays strong. Self-expression in the air, drawing some beautiful lines, and having fun with a hundred of my friends in some of the most beautiful places on earth. Himachal About Blog Team of dedicated professionals who are having experience of many years in the field of paragliding and various other adventure activities. Scotland, United Kingdom About Blog Nylon Wing is a paragliding adventures of an ex-skydiver. For more than 15 years I regularly jumped from aeroplanes. I was involved in competition overseas and eventually instructed first timers to make that life-changing leap. Paragliding was always on my mind and was the obvious choice as a way of enjoying un-powered flight in the mountainous environment near my home. About Blog I am the Canadian female paragliding champion since 2003, ranked 3rd overall in Canada, and a member of Team Canada. I hold the Canadian female distance XC record as well as the altitude gain record. I represented Canada at the FAI World Championships in 2005, 2007, and 2009, and have flown in various Paragliding World Cups (including the recent Valle de Bravo Superfinal) since 2010. About - A blog about Paragliding, Paramotoring, Hang Gliding, Speed Flying, Freeflight, Equipments and more. Flybubble is a freeflight equipment retailer and flying training centre based in the UK, specialising in personal attention and outstanding service. They stock a wide range and offer expert buying advice, fittings, demo flights, part exchanges and used gear. About - I’m Tim Pentreath and I’ve been paragliding since 1990 and have been flying Advance wings since 1998 when Gavin Foster sold me a second-hand Omega 4. Over the years I’ve flown in a number of comps – BPC and British Opens – and in 2014 I flew in both rounds of the British Champs for the first time and won the Sports Class in Ager and came 3rd place in the Championships in Sports Class. About - For more than 15 years I regularly jumped from aeroplanes. I was involved in competition overseas and eventually instructed first timers to make that life-changing leap. Paragliding was always on my mind and was the obvious choice as a way of enjoying un-powered flight in the mountainous environment near my home. 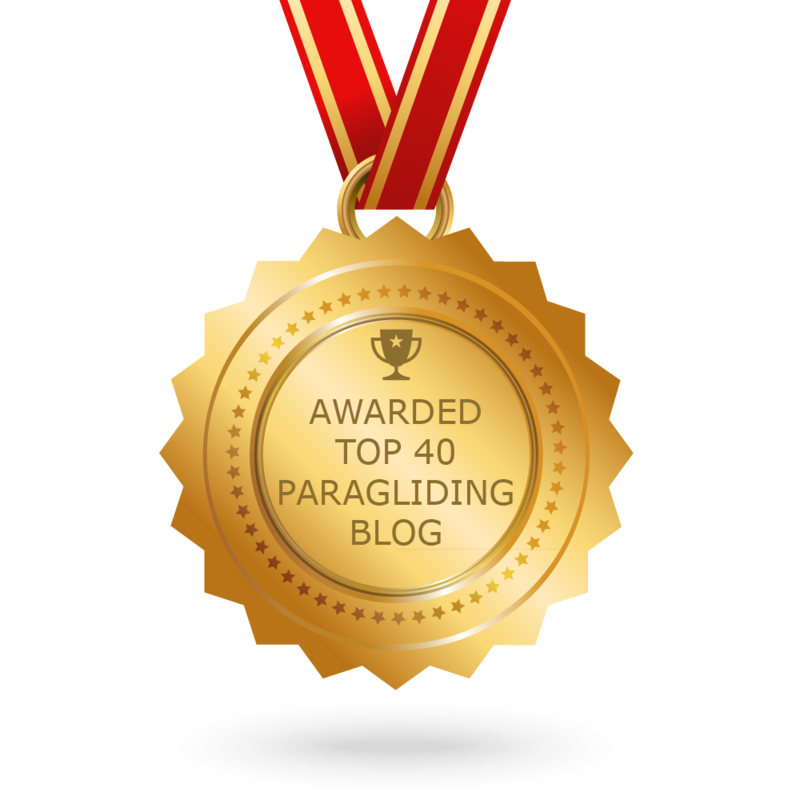 CONGRATULATIONS to every blogger that has made this Top Paragliding Blogs list! This is the most comprehensive list of best Paragliding blogs on the internet and I’m honoured to have you as part of this! I personally give you a high-five and want to thank you for your contribution to this world.